Broken Helm Hollow is a small bandit camp in the southeast corner of The Rift. 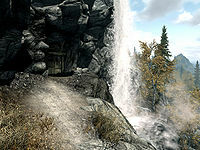 It is located on the eastern face of the small peak southeast of Riften near the large waterfall. The cave has only one zone: Broken Helm Hollow. Two low-level bandits stand guard directly outside of the entrance. The treasure chest for Treasure Map IX is located partway down the waterfall next to the entrance, assuming that you have obtained the map. Alchemical samples found throughout the cave include: blisterwort, Namira's Rot, imp stool, fly amanita, bleeding crown, white cap, and a growth of glowing mushrooms. The cave contains three sleeping bandits, two in the main campsite and a chief bandit on a raised area overlooking the camp. It is possible to take all three bandits unawares, if sneak mode is employed, so take care to avoid the bone chimes when entering the main chamber. Ahead you will see the two sleeping bandits and the bandit camp. It is advisable to first take out the chief bandit sleeping on the ledge overlooking the camp as you have the opportunity for the first strike. Provided this leveled bandit has not been roused, a variety of sneak attacks, poisons, or a shout can be used to weaken him before he gets his bearings. The two bandits down below will sleep through the altercation. Once the chief bandit is disposed of the remaining two bandits can also be removed by sneak attack. An alternate strategy is to climb onto the table at the back wall of the camp and then jump up onto a large rock outcropping. This will give you an elevated position, a view of the entire chamber below, and allow protected range attacks on the chief bandit. The boss-level chest is located on the raised area by the chief bandit. It is protected by a swinging mace trap with a novice-locked tension cable trigger on the right side of the chest. Next to the chest is an end table containing a copy of the Two-handed skill book Battle of Sancre Tor and a random potion. Next to the end table is a bookcase with a copy of Darkest Darkness. There is little in the way of treasure in the campsite, but the camp does feature a tanning rack and cooking pot. A pull chain can be found next to a torch sconce at the bottom of the slope leading up to the raised area. Activating the pull chain will reveal a hidden room. Inside is an end table containing a spell tome, a poison, and a weapons rack holding a steel sword and a hunting bow. However, most notably, the room also contains the body of a Nord. The corpse will be anonymous unless the miscellaneous quest Flight or Fight has been initiated. Because of a bug, it is recommended not to activate/search his body until you start the quest by talking to Grosta. Three corundum ore veins can be found here: one next to the stream inside the cave, one inside the secret room, and one outside at the bottom of the waterfall. At the base of the waterfall, near one of the corundum ore veins, is the body of a dead Khajiit with a coin purse and 4 loose gold coins next to him. Three levels higher on the waterfall cascade, there are 5 more gold coins and an iron sword. The corpse in the hidden room is revealed to be Grosta's missing husband Leifnarr during the Flight or Fight quest. Broken Helm Hollow appears in Elder Scrolls Online. Broken Helm Hollow isn't marked as a cave, so cave-based radiant quests won't target it. The corpse in the hidden room is revealed to be Grosta's missing husband Leifnarr during the Flight or Fight quest. Leifnarr's body is unnamed, identified only by the generic title of "Nord". If you find this corpse first without talking to Grosta, the quest will activate stage 15, "Report Leifnarr's Death to his family", but no dialogue option will be added to Grosta making the quest unable to be completed. This page was last modified on 7 August 2018, at 19:12.